Donald Keene: The scholar of Japanese literature has little time for Murakami. Why the U.S. academic became a Japanese citizen. Like many of the best things in Tokyo, the French restaurant is underground. Outside, only the lettering “Vincent” on a slab of stone – more tombstone than marquee – alerts you to its existence. Yet walk down the stone steps and you enter another world, one of red upholstery, antique mirrors and bone china. The man I am to meet is also a hidden treasure. Not so hidden in Japan, admittedly, where he is a legendary figure, one who has dedicated his long life to interpreting Japanese culture for western audiences. At 89, the 20th-century’s premier scholar of Japanese literature has risen still further in Japanese estimation. Shortly after the country was laid low by an earthquake and tsunami in March, the academic said he would leave his native America for good, become a Japanese citizen and live out his last days in Japan. The announcement made headline news. Japanese spoke, many with tears in their eyes, of the courage he had given them in their hour of need. 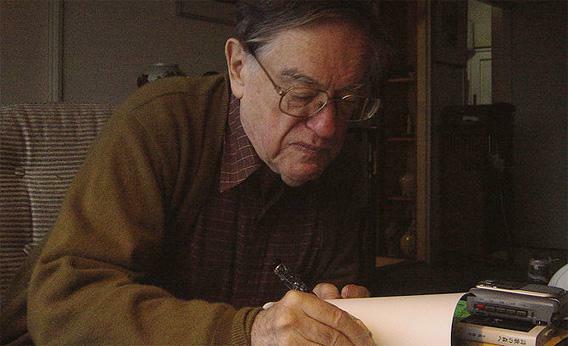 After delivering his last lecture at Columbia University, where he taught for more than 50 years, Donald Keene wrapped up his life in New York. We meet in mid-October, not long after his move to Japan. Our restaurant is in Roppongi, a high-octane district of clubs and bars. But I am underground – in the France of a different era, waiting for an American with a thousand years of Japanese literature in his head. The lone waiter is loitering nervously. The chef is pacing the pavement above, ready to greet the professor. The man led gently down the stairs a few minutes later is small, no doubt shorter than in his youth. He wears a dark suit and walks slowly, very slightly stooped. He greets me with an old-world charm and a “no-no-no, not-at-all” modesty. Later he tells me, “I’m a very atypical American in that I have great trouble saying nice things about myself.” His accent bears traces of Brooklyn but is overlaid with the diction of the lecture hall. Keene sits down. Apart from us, the restaurant is empty. After surveying the menu as one might an ancient scroll, he looks at me with a twinkle. “Are you going to be working this afternoon?” he asks. The euphemism is perfect for Japan, where the unspoken often trumps what is said. I infer that he would like a glass of wine. Since we are both having fish, we settle on white. The waiter returns with a bottle of Puligny-Montrachet from 1995. The wine is complex and Keene looks pleased. We both choose the escalope de saumon tiède as a starter. The soup of the day is chestnut. Keene asks for the filet de bar aux épices, though he uses the Japanese word suzuki, meaning sea bass. I have the red sea bream, suprême de daurade à la provençale. The ordering done, I steer Keene back more than 70 years to when, as an 18-year-old, he came across a translation of The Tale of Genji in the Astor Hotel in New York. At the time, Keene was studying French and Greek literature at Columbia University, having won a scholarship to study there at the age of 16. He bought the book because, at 59 cents, the epic story, written 1,100 years ago, contained more words per dollar than any book in the store. That was how the love affair began. The waiter arrives with two plates in silver covers and removes the lids simultaneously to reveal the salmon. It comes in a creamy sauce with a hint of lemon, giving it a mouth-watering piquancy. “I took my recent purchase home, not expecting too much, and then I started to read.” He pauses for effect. “I was captivated. It was about a world where there was no warfare. It was a world where people had likes and dislikes and sometimes did unpleasant things but they were not evil.” The translation was “a thing of magic, incredibly beautiful”. The story, written by Murasaki Shikibu, a lady-in-waiting, depicts the intimate life of the Kyoto court in Heian-era Japan. Keene considers it the world’s first novel because it deals with the internal life of the characters. These are sensitive matters, that still dog Asian politics. I could ask why Keene seems more troubled by Chinese propaganda than by Japanese atrocities. But I leave it and turn, instead, to his decision to become Japanese. I wonder what motivated him and whether Japan, still a closed society, has welcomed his gesture. The fish arrives, again under silver covers. His is swamped in a creamy sauce. mine topped with tiny white fish and sea urchin. Has the Japanese government, I ask, been as responsive? Immigration officials required documentation proving his parents were married, something he is still struggling to locate. Then they needed proof that he was American. A US passport did not suffice. Finally, they requested evidence that Keene, the most famous foreign scholar in Japan, had graduated. “I said, ‘Well, I have various honorary doctorates, including from very important Japanese universities.’ ‘Oh, that doesn’t count,’ they said, ‘because honorary doctorates are given to people even without education.’” Keene confesses to being irritated. “This fish is delicious. I hope yours is too,” he says, brightening. I want to use our remaining time to talk to Keene about the rich canon of Japanese literature. Keene has written some 25 books on Japanese history and culture, including a four-volume history of literature that has become the standard work. The dessert cart arrives, making me conscious of how little time we have and how much Japanese literature there is to get through. The waiter lists the options, each one punctuated by a groan of joy from Keene. There’s honey cake. “Oh.” And chocolate cake. “Ah.” And banana caramel mousse and compote of pear. “Oh, this is terrible.” He opts for fruit tart and is persuaded to have the pear mousse as well. I go for pear mousse and fig tart. We turn to more modern times, though not to the crop of current writers led by Haruki Murakami for whom Keene evidently has little time. Instead, we discuss Natsume Soseki (1867-1916), considered the greatest of Japanese novelists, Yasunari Kawabata (1899-1972), who won the Nobel Prize for Literature in 1968, and Yukio Mishima (1925-1970), a troubled genius who ended his career by disembowelling himself in public. “He was an extraordinary person,” says Keene, who knew Mishima well. They had met, symbolically enough, outside Tokyo’s Kabuki-za theatre in 1954, and had gone to see plays together. Keene had translated one of Mishima’s modern Noh plays. “He died, as you know, at the age of 45, leaving at least 45 stacked volumes of novels, plays, criticism, poetry.” Mishima slit his belly after leading a failed, and farcical, coup to restore the emperor’s power but Keene thinks he committed suicide because he was passed over for the Nobel Prize. During the 1964 Tokyo Olympics, Mishima had written Keene a letter with the line, “I envy the athletes who know if they are first, second or third.” Keene says: “That was all he said but I knew exactly what he meant.” The irony was that Kawabata, who did win the Nobel Prize, also committed suicide because of the pressure of living up to his new reputation.